Create new groups by clicking the Add Group button. Sort and search for existing groups by ID, Name, or Description. Filter the list of existing groups by Type. Show the number of associated guides for each group in the Guide Count column. Edit a group's settings (general settings, user access, look and feel, etc.) from the Edit Group () icon in the Actions column. Delete a group by clicking the Delete Group (x) icon in the Actions column. Note: deleting a group cannot be undone. 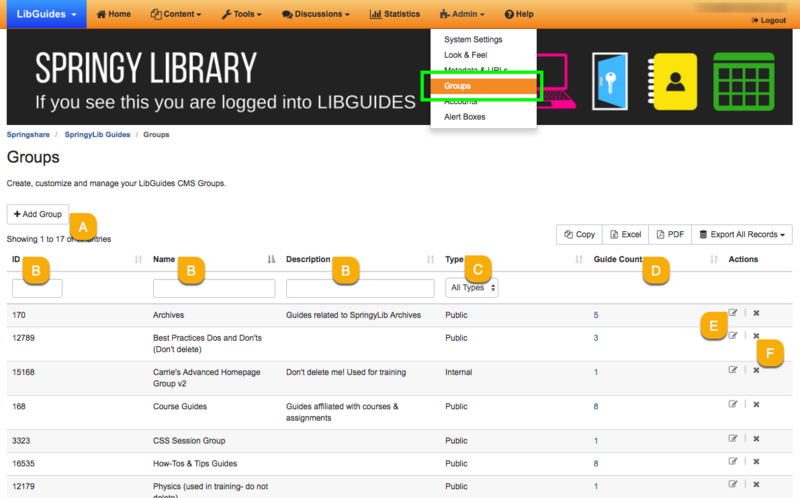 When a group is deleted, associated guides will have their group assignment removed, but the guides are not deleted.